Pilot Pen of America hosted LeanJax's Lean Leaders Meeting on March 7, 2019. 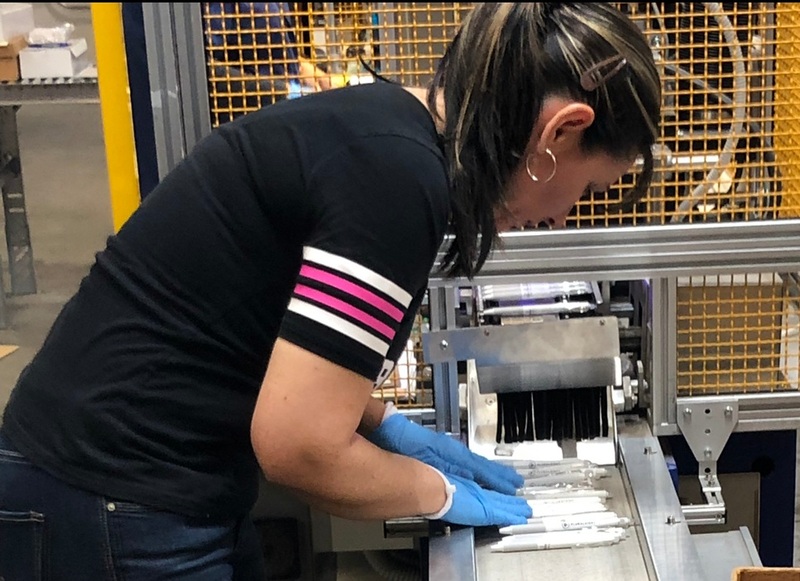 Pilot Pen’s Lean leaders Mike Ryan and Manny Miranda presented a review of their company’s Lean implementation, led LeanJax members on a tour of it’s impressive manufacturing and distribution facilities, and provided the attendees with insightful lessons learned, tips, and free samples! Pilot Pen of America started its Lean journey in 2005 and has been an active member of LeanJax ever since. LeanJax membership has enabled Pilot to find improvement ideas and best practices to leverage in its' facilities, while openly sharing it's knowledge and experiences with co-members. LeanJax has aided Pilot in completing Lean projects to increase efficiency, improve safety, increase revenue, and create a continuous improvement and respect for people focused culture. Pilot’s G2 is the #1 selling gel pen in the United States. Jacksonville became the company’s corporate headquarters in 2010, where it employs 250 people. The Jacksonville location is the exclusive manufacturer and distributor of Pilot’s G2, the number one selling gel pen in the United States, which has helped the company generate a consistent increase in sales each year. The company holds a market share of 28% of the pen market and 13% of all writing instruments. The company’s manufacturing facility displays the benefits of effectively applying Lean to each area. This is seen throughout the facility where workers continuously improve their work, eliminate waste, and ensure quality and productivity by utilizing disciplined 5S workplace organization techniques, mistake proofing their processes, and generating “bright ideas.” Visual management boards are ubiquitous, fostering strong communication between work teams, where they can surface problems and celebrate improvement efforts . The manufacturing work cells are set up in a “U” shape which minimizes unnecessary movement of materials and eliminates the need for operators to walk long distances. This helps limit the amount of WIP and supports continuous flow of materials. Additionally, the manufacturing facility stays on top of production status through visual indicators, while receiving real-time scheduling and customer demand up dates. The distribution warehouse was designed with the Lean principles of “flow” and “pull” in mind. Its’ process is paperless and visually driven with color-coded display boards that provide all workers with real-time updates via electronic kanban cards. This “just-in-time” Lean system provides the area with load leveling capabilities, enabiling it to achieve flexibility and seamlessly adjust to changes in customer demand. Pilot Pen of America is a first-rate Lean organization that shows respect for people and strives for continuous improvement, while delivering exceptional customer value and generating great results. Thank you to Mike Ryan, Manny Miranda, and Pilot Pen of America for hosting and facilitating! I’ve officially entered the 2010s and started a LeanJax page. Follow us at https://www.instagram.com/lean_jax/ for event pictures, news, and Lean implementation tips. The “Visual Leadership Center” at Medtronic set the stage for the first Lean Leaders meeting of 2019. Leaders from LeanJax member companies as well as prospective members from across Jacksonville and the First Coast were treated to a tour and discussion of Medtronic’s incredible implementation of Lean principles. Industries represented at the meeting ranged from multiple types of manufacturing to various service based businesses.